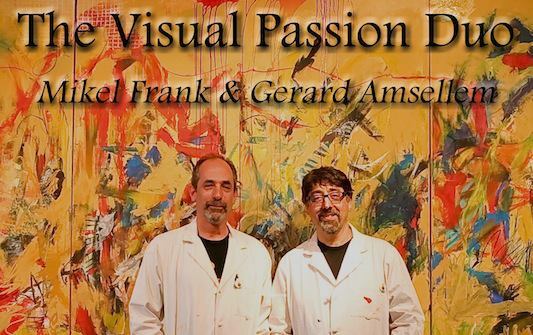 Mikel Frank and longtime collaborative painting partner Gerard Amsellem, who both form the The Visual Passion Duo, will present a 5-hour live painting collaboration to live music by local musician, Noel Freidline. Anyone and everyone is welcome to come watch, and see the exhibition that will be on view! Visual Strategies: A Collaborative Project (FaceBook page) is a Guest exhibit / set of events this Summer at ClearWater Artist Studios. It is being organized by two collaborators: local artist/ curator, Mikel Frank, and collaborating curator & artist, Carl Heyward. Frank recently moved to Charlotte from the New York City area and a 29-year career at the Met Museum of Art, and is now an adjunct art instructor at Rowan-Cabarrus Community College and Gaston College; Carl Heyward is an artist and founder of the Global Art Project, and lives and works out on the West Coast. Participating artists from the Global Art Project (GAP) are shipping their jointly-made works in from all over the world for the exhibit, and there will be three live-collaborative-painting events, including one that's for YOU (or anyone) to participate in, on Saturday August 11! See the Main Exhibition Event Listing on our Website, www.clearwaterartists.com or on Eventbrite as well as the FB pages linked above. Call the Studios at 704-784-9535 with any questions, or email clearwatermgr@gmail.com. FaceBook 'Gallery' page for the Exhibition is here. ...And YOU! ...created during Related Events at ClearWater, listed below. This upcoming Guest exhibit / set of events, "Visual Strategies: A Collaborative Project" at ClearWater Artist Studios, is being organized by two collaborators: local artist/ curator, Mikel Frank, who recently moved to Concord from NYC and a 29-year career at the Met Museum of Art (2 years ago), and is now an adjunct art instructor at Rowan-Cabarrus Community College; and collaborating curator & artist, Carl Heyward, founder of the Global Art Project, who is out on the West Coast. The local artist Mikel Frank is working to invite more local artists familiar with collaborative art-making, to participate also. Mikel and longtime collaborative painting partner Gerard Amsellem, who both form the Visual Passion Duo, will present a 5-hour live painting collaboration to live music by local musician, Noel Freidline. This is in conjunction with our monthly 2nd Saturday Open Studios on Saturday, July 14th, from 11:00am to 4:00pm (doors open at 10am). Community is Invited to come paint a large work togeher that will then be added to the Exhibition! 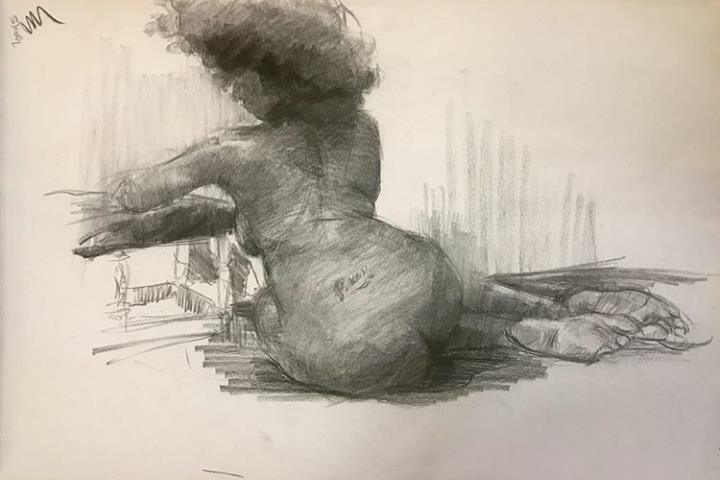 We are sorry to announce that tonight's (June 21, 2018) Figure-Drawing Session has been canceled. We apologize for any inconvenience and hope you'll join us, next month! Details for the usual event, are below. 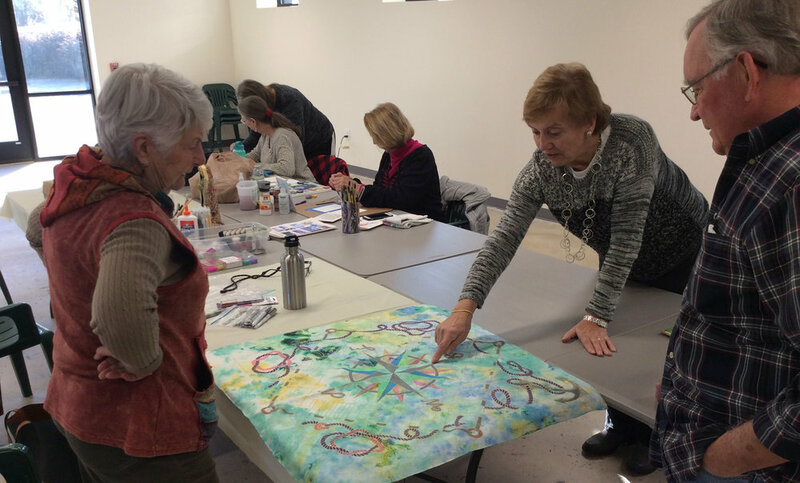 For a cost of $15 per artist (any revenue over the cost of hiring the model will go to the ClearWater Artists Coalition, to be spent toward bringing you this and other events). Bring your own materials and refreshments. 18 and over please. Professional conduct is expected and required. Arrive before 6pm or you will have to ring doorbell for entry. We look forward to seeing you here. Southern Piedmont Woodturners Club holds monthly meeting/ woodturning demo or workshop, every third Tuesday of the month in their studio - #122 - at ClearWater Artist Studios in Concord, NC. All are welcome! Come out and learn about this ancient and fun craft. Watch master portraitists as well as area painters all work to finish completed portraits, working from a live model in our Gallery, in less than two hours flat! With free Cake, open studios and a comedian EmCee. Paintings on exhibit by the 5 Featured Painters, through April 6. Weather Update Announcement: We are canceling tonight's event due to black ice Weather Advisory issued by the National Weather Service. See you in February!